And then… what? 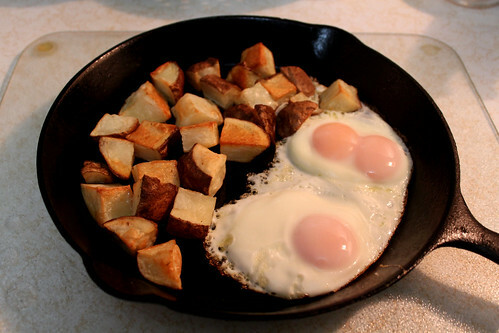 The very next time I made it… another double yolk? 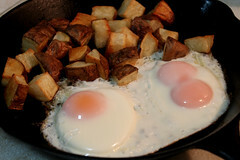 Yes, two double yolks in the same carton of eggs, and weirdly they both end up in this meal, in the same place in the pan. Insert spooky music. Better photos the second time, I think. So anyway, here’s the recipe. Why do you need a recipe for such a simple meal? 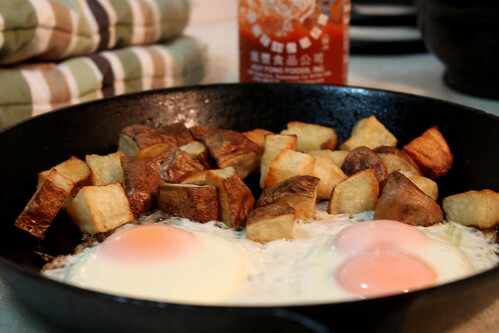 Well, I think I’ve tried every conceivable method possible for making home fries + fried eggs, but this way? They turn out perfect every. single. time. Also: zero mess. Win. 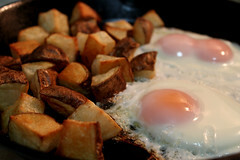 This entry was posted in Edibles and tagged Recipes on March 13, 2013 by Theryn. Best type of recipe. Little of this, little of that, check for the smell and the look.